Photo Reflection of the Day #238: Here's The Train! 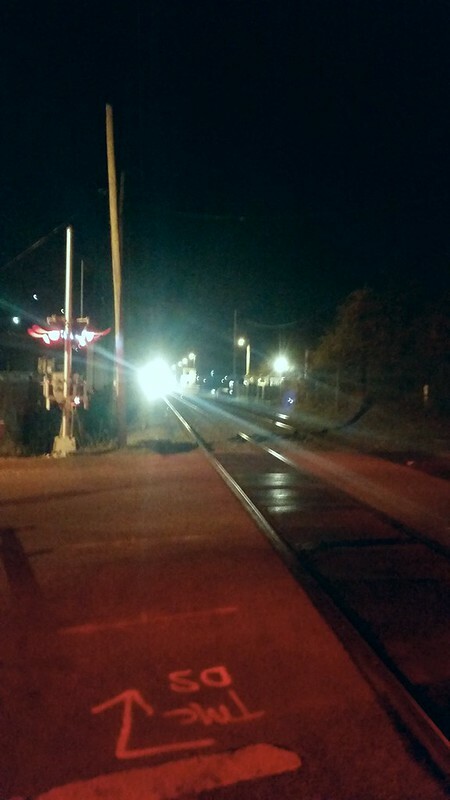 A train approaching a street intersection at night. Apparently, I like trains or at least train crossings. I can understand this to some degree as it is an intersection of kinds--cars and trains. I also enjoy take shots from a bridge, which is an intersection of cars and boats. Near my house is a train intersection and on nights when I am walking, I sometimes get stuck waiting for the train to pass by. It takes a few moments and I'm always disappointed that I don't have any change to put on the tracks to flatten, but the passage of the train is still a strangely enjoyable incident for me.